Topics: Rebates, Coupons, and Financing. Cedant Web Hosting (California, Davis) is the location of the Apache server. 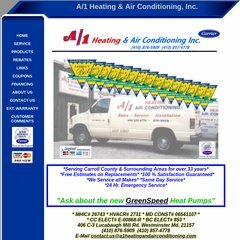 A1heatingandairconditioning.com's server IP number is 66.175.58.9. It has 3 DNS records, dns2.earthlink.net, dns3.earthlink.net, and dns1.earthlink.net.